Blog / All Aboard AlibreCAM 2017! MecSoft’s CAM plug-ins are well known for their seamless integration and ease of use. 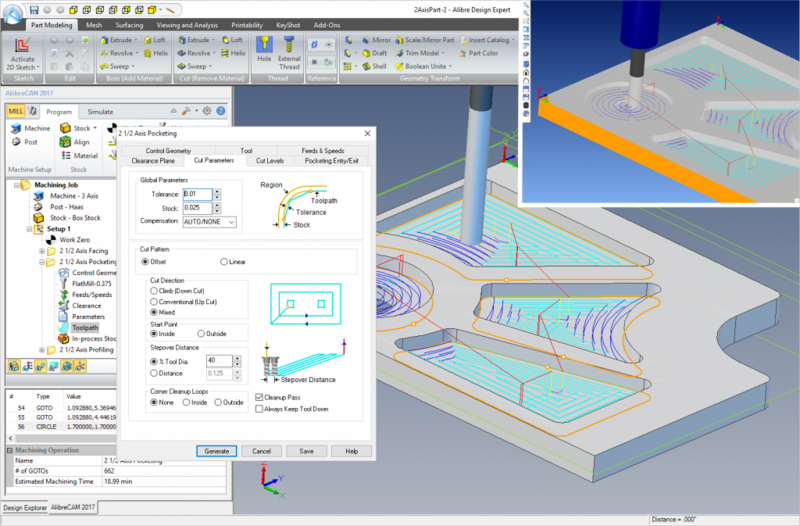 Now you can design with Alibre Design and then program and post toolpaths from AlibreCAM with the convenience and knowledge that your parametrically-driven revisions are fully reflected in your your toolpath strategies! Also, AlibreCAM runs just as efficiently on any of the 3D part file formats supported by Alibre Design! The AlibreCAM 2017 User Interface is a seamless integration with Alibre Design! AlibreCAM 2017 is available in 4 configurations (Express, Standard, Expert and Professional). Check out these machining capabilities, all from the comfort of your own Alibre Design program! This general-purpose configuration may be tailored for hobbyists, makers and students but it is still packed full of real machining power! A total of (5) 2½ Axis toolpath strategies are included (Facing, Pocketing, Profiling and Engraving). Oh, and add Drilling to that as well as 3 Axis Horizontal Roughing and 3 Axis Parallel Finishing and you have a complete machining package that can cut most entry-level component part. AlibreCAM 2017 Express packs a punch at an entry-level price! Here we see 2½ Axis Facing, Pocketing and Profiling (Inset Top Right) You also get a complete Cut Material Simulation engine, all within Alibre Design! This general-purpose configuration provides even more machining strategies and advanced capabilities. A total of (10) 2½ Axis and (4) Hole Machining strategies (Drill, Tap, Bore and Reverse Bore) are included along with 3 Axis Roughing and (4) unique 3 Axis Finishing strategies (Horizontal, Parallel, Radial and Spiral). This configuration also includes advanced Surface Feature Machining (illustrated in the image below). 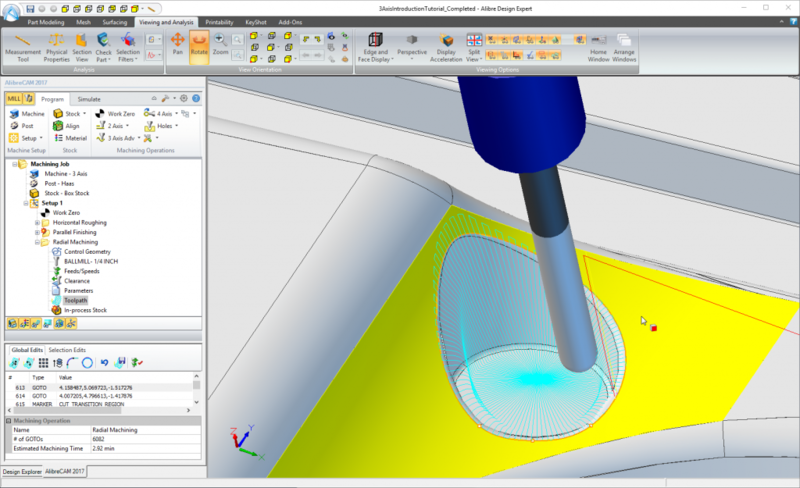 This capability allows you to machine a selected subset of surface features controlling the tool’s end condition (ON, TO, PAST) at the surface perimeter while maintaining tangent gouge-free machining with adjacent surfaces! Oh, and our Advanced Cut Material Simulation is included at no extra cost! AlibreCAM 2017 Standard is a complete 2½ and 3 Axis machining power-house! Here we see advanced Surface Feature Machining with perimeter tool positioning controls (ON, TO, PAST) for tangent, gouge-free machining with adjacent surface features. (Inset top right) Our Advanced Cut Material Simulation is included also! If you need true 4th Axis machining capability or just want to finally put that 4th axis attachment you have to good use, this configuration is for you! Everything 4 Axis is included such as indexed and continuous roughing and finishing operations, 4 Axis Rotary Indexing and 4 Axis Hole Machining! A total of (8) 4 Axis strategies are included (Facing, Pocketing, Profiling, R-Level Roughing, R-Level Finishing, Projection Pocketing and Engraving). This is on top of everything included in the Standard configuration! AlibreCAM 2017 Expert is a 4 Axis dream come true for Alibre Design users! 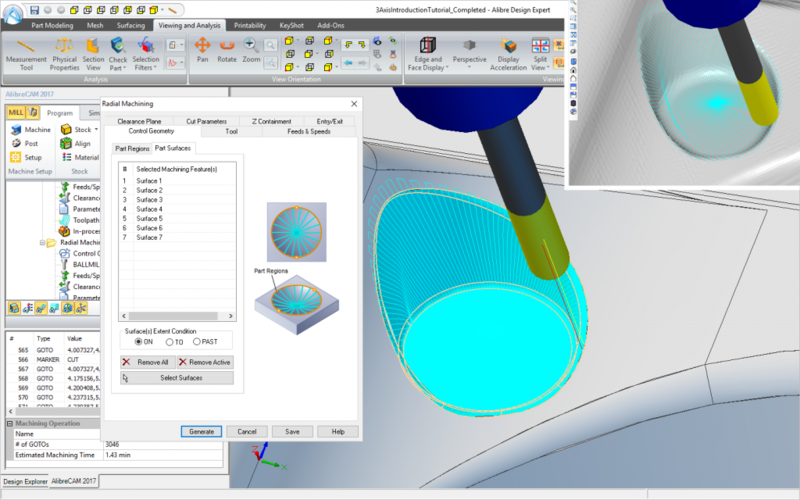 Here we see the 4 Axis continuous Parallel Finishing operation dialog with the Cut Parameters tab displayed. On screen we see the 4th axis Axial Containment graphical indicators for the easy interpretation of the linear and rotary containment parameters. 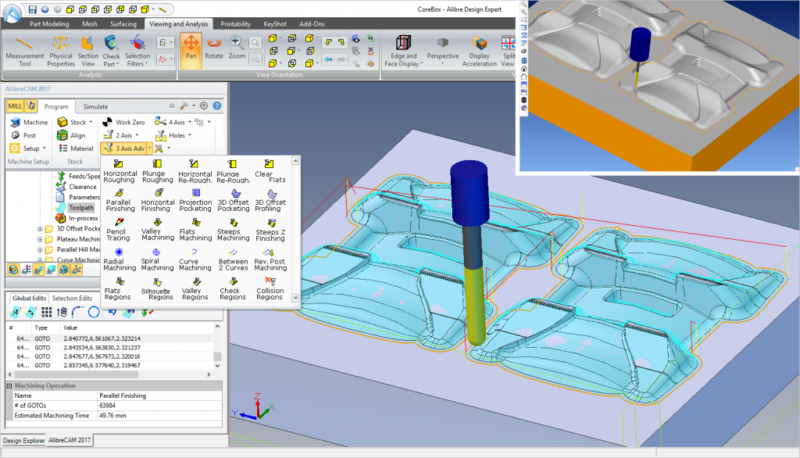 (Inset Top Right) Advanced Cut Material Simulation of the 4 Axis Parallel Finishing toolpath. If your shop demands advanced 3 Axis tool path controls and strategies, this configuration has it all and more. Ideal for mold tool & die applications, wood working, rapid prototyping and general-purpose machining applications that require the detailed control of tool motions. 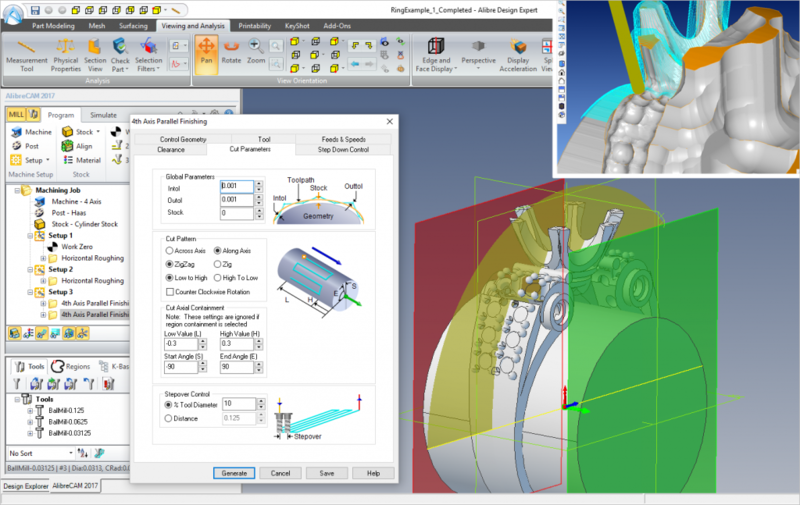 This configuration contains all of the Expert configuration features plus a total of (20) Advanced 3 Axis tool path strategies! If that’s not enough, you also get indexed 5 Axis Setups. Referred to as 3+2 machining, this allows you to setup and position your toolpaths anywhere your 5 Axis Machine Tool can reach – all without sacrificing ease of use. AlibreCAM Professional has all of the advanced features of Expert with the addition of all of MecSoft’s Advanced 3 Axis Machining strategies (20 in all) ideal for the detailed tool control required in today’s mold tool & die applications. Indexed 5 Axis setups (referred to a 3+2 machining) is also included in the Pro configuration. We encourage one and all to climb aboard and check out AlibreCAM 2017 for Alibre Design! For more information about AlibreCAM and the latest release and configuration information we invite you to visit our AlibreCAM product page! To download AlibreCAM now and give it a test drive we encourage you to visit the AlibreCAM download page! Joe Anand has been President and CEO of MecSoft Corporation since 1997. Previously Joe worked for Siemens UGS PLM Software running a Custom Projects group implementing specialized projects for strategic global partners such as GM, Opel and GE as well as working on 3D machining algorithms for the NX product series. Before that he worked at Intergraph Corporation and was responsible for rewriting Intergraph's 3 Axis milling product. Earlier, Joe held senior positions at Auto-trol Technology and GE Calma. Joe earned his MS degree, in Mechanical Engineering from Clemson University with a research emphasis on robot path planning and motion simulation.